Was World War III just averted? Though not discussed fully in the western media, it appears that the contingent that started a civil war in the Ukraine indeed recently tried to kick off WW III. These are the facts. On March 7 Kiev in the Ukraine solicited network communication traffic heading for Britain. They did this aggressively, but only for 5 days. What occurred was that transmissions from Houston to the UK’s Atomic Weapons Establishment and the Queen’s mail was available to Kiev to be manipulated. There was clearly an agenda afoot. For five days, web traffic from Texas to certain addresses in the UK has been routed through Ukrainian and Russian telecoms, taking a detour thousands of miles out of the way. Network traffic often takes a circuitous route as a result of network congestion or interconnection difficulties, but neither one would be enough to account for these routes. 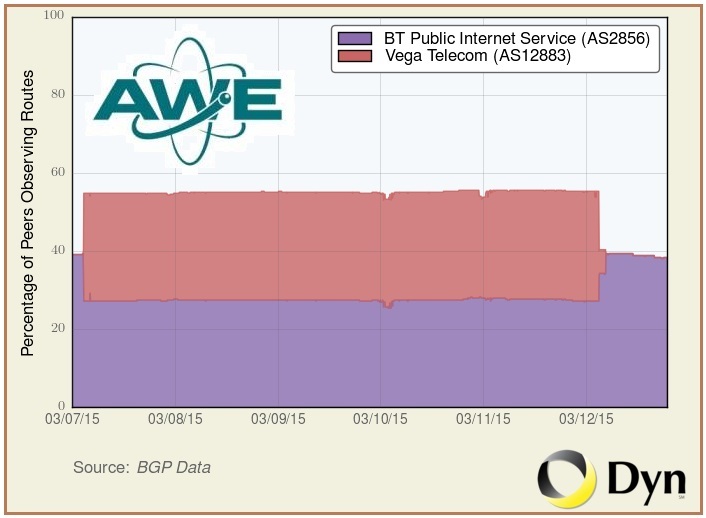 Instead, this was the result of a bad route announced by Ukraine's Vega telecom, inserting itself in between. Among the dozens of sites involved was the UK's Atomic Weapons Establishment, which is tasked with managing and delivering the UK's nuclear warheads, as well as the UK's official mail service, the Royal Mail. US defense contractor Lockheed Martin was also running a VPN connection that was caught up in the redirection. Beginning on Saturday [March 7], Ukrainian telecom provider, Vega, began announcing 14 British Telecom (BT) routes, resulting in the redirection of Internet traffic through Ukraine for a handful of British Telecom customers. Early yesterday morning [March 12], Vega announced another 167 BT prefixes for 1.5 hours resulting in the rerouting of additional traffic destined for some of BT’s customers, including the UK’s Atomic Weapons Establishment, the “organization responsible for the design, manufacture and support of warheads for the United Kingdom’s nuclear deterrent.” So for about five days, a significant portion of the Internet was sending traffic destined for these routes to Vega in the Ukraine. The Royal Mail group is the postal service company of the UK. Our trace routes show that traffic continued on to British Telecom after passing through Kiev. Recall that Kiev overthrew their elected President, who was sympathetic to Russia, to start a civil war. Then they shot down MH 17 trying to get NATO and the US into a war with Russia. When this did not succeed, they shot Nemtsov in the back near the Kremlin. And when this still did not result in NATO going to war with Russia, this newest game was to trigger a nuclear war between the UK and Russia. Nice guys, eh? Putin disappeared on March 11 but on March 16 Putin reappeared as scheduled for a meeting in St. Petersburg with the Kyrgyzstan President. ZetaTalk Insight 3/21/2015: What do misdirected communications between Houston and the UK's Atomic Weapons Establishment and Royal Mail on March 8, NATO war games in Norway on March 10, Fox news hosting a retired US General on March 10 who asserted that Russians should be send home in body bags from the Ukraine, Putin canceling engagements on March 11 and going missing, the Kremlin hinting on March 13 that Putin would make a major announcement on March 16, and a sudden Russian military exercise in the Arctic near Norway on March 15 have to do with one another? Putin emerged for his March 16 presser with the President of Kyrgyzstan, as scheduled, but there was no special announcement. The key here are the encrypted communications from Houston to the UK, which the Ukraine hijacked. 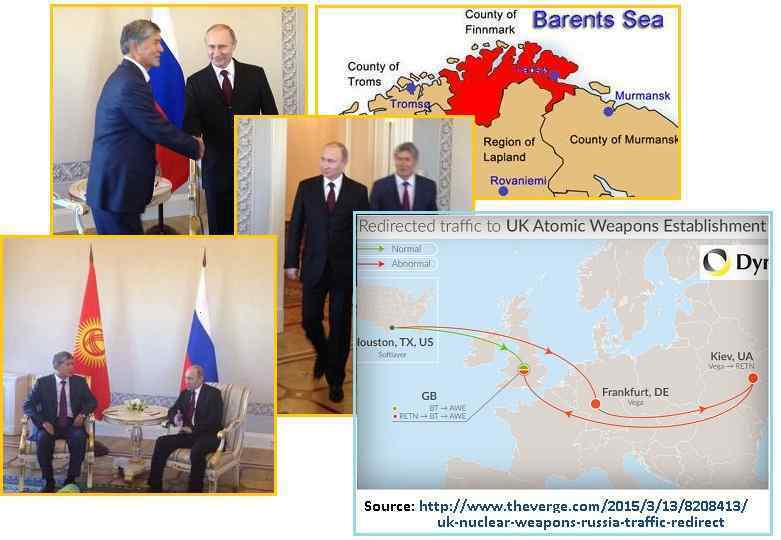 The Ukraine did not intend for this to be discovered, but rather intended to alter the messages to instruct the UK to launch nuclear missiles at Russia. Russia was expected to react, and then NATO was expected to muster forth to defend NATO countries. Combined with the NATO exercises in Norway, a war with Russia, just what Kiev wants, would be in process before it could be stopped, or so it was hoped. This was not lost on the Council of Worlds, who stepped in to ensure no messaging was altered but rather that the hijacking was discovered. 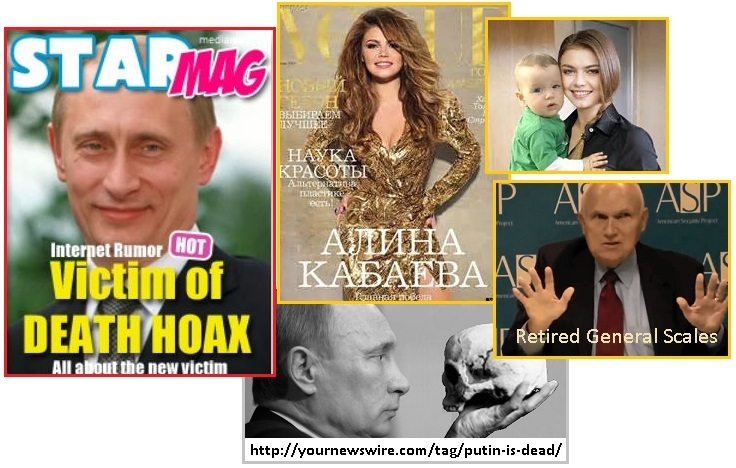 Meanwhile Putin and his main bodyguard went into hiding, a Retired US General Scales declared on Fox News that Russians should be sent home from the Ukraine in body bags, Ukraine and Israeli websites declared that Putin was dead, and speculation of all kinds when into overdrive. The rumor mill went into overdrive, churning out possible explanations from the simple to the salacious to the sinister. He had been stricken by the particularly devastating strain of flu going around Moscow just now. He sneaked off to Switzerland for the birth of his love child. He had a stroke. The victim of a palace coup, he was imprisoned within the Kremlin. He was dead, aged 62. The last confirmed public Putin sighting was at a meeting with Prime Minister Matteo Renzi of Italy on March 5. Gen. Rob 'Kill Russians' Scales: Whuh? They Watch Fox in Russkiyland? Responding to the news that the Russian Investigative Committee has opened a criminal probe into his statements on charges of public calls for starting an aggressive war made in the media, and that his remarks violated article 20 of the United Nations' International Covenant on Civil and Political Rights that bans any propaganda of war and instigation of discrimination, hatred or violence, [retired Maj. Gen. Robert Scales] shrugged it off. Earlier, he alleged that "the only way the United States can have any effect in this region and turn the tide is start killing Russians. Killing so many Russians that even Putin's media can't hide the fact that Russians are returning to their motherland in body bags. Meanwhile through this whole affair was the tantalizing rumor that Putin was about to make an important announcement on March 16. This announcement never arrived. Per the Zetas, the announcement was to kick off the admission about Nibiru, but too distracted by Kiev’s latest attempt to plunge the world into war, on their behalf, this was once again delayed. Meanwhile, the perpetrators will be hunted down and killed, per the Zetas. News came out about the Kremlin preparing a major announcement. A source in the Russian President Vladimir Putin’s press service, heads of the most relevant media were asked to be ready for a possible press conference in the next few days. ZetaTalk Insight 3/21/2015: Kiev’s backers are desperate to push into the Russian oil and gas fields just to the east of the Ukraine, just as Netanyahu is desperate to commandeer the US military for his hoped for war against Iran in the Middle East. But neither will they win. Was there more to this game than Kiev’s ambitions? The latest plan to commandeer the UK’s nuclear weapons was intended to stop the anouncement from beginning, as Putin was on the verge. There was side action, attempts at the last minute to assassinate Putin, thus he and his main bodyguard were absent for days. Many, such as the Retired General Scales on Fox News, revealed their alliances. Putin did not reappear until these investigations were well underway, and the guilty in hand. Who is colluding or associating with the guilty is noted and traced. Black ops are countered by black ops, who operate without trial or jury and eliminate the guilty quietly. We had this in the US in 2000 and 2004, when Diebold paperless voting machines secured the White House for the Republicans. We had this recently in Scotland when the Queen arranged for their independence to be snuffed, paper ballots on this or that pile being moved and destroyed. And now we have this in Israel with the polls leading up to the election and in particular the exit polls sharply disagreeing with the final result. If Netanyahu could arrange for the Mosad to assassinate Iranian nuclear scientists, how difficult would it be for him to fix an election in a country where the ultra-right have, in the past, publically assassinated their Prime Minister Yitzhak Rabin? What are the facts? Netanyahu was losing in the polls going into the election, losing in all the polls, and this was the steady trend just days ahead of the election. Historically accurate exit polls, taken by numerous Israeli media, showed a tie between Netanyahu and Hertzog, with the Arab coalition next in line. This on the day after Netanyahu had insulted the Arabs and Palestinians. Netanyahu was desperate early in the day on election day, March 17. He was pleading with the ultra-right to help him. He was making firm promises to deny the Palestinians their land rights but to rather increase Israeli settlements. He looked crest-fallen, but then hours before the polls closed, he suddenly brightened and despite what the exit polls showed, declared victory. Per a post-election review, the election was rigged for Netahanyahu, the worst case of election fraud Israel had ever suffered. Zionist Union had a lead of four seats over Likud – 26 to 22. The Maariv poll showed the same gap but different tallies – Zionist Union with 25 seats against the Likud with 21. The gap between the two main parties in the poll conducted by the second radio channel was identical to that of Maariv, while Walla! 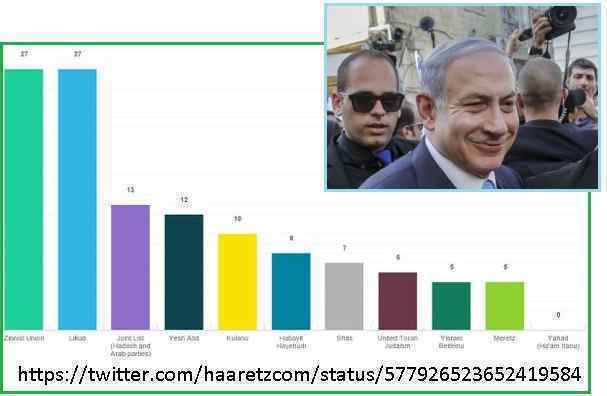 website published a poll in which the gap was only two seats – 25 for Zionist Union against 23 for Likud. Exit polls for Israel’s elections today show a very tight race between the Likud party, led by Prime Minister Benjamin Netanyahu, and the Zionist Union alliance, led by Isaac Herzog and Tzipi Livni. 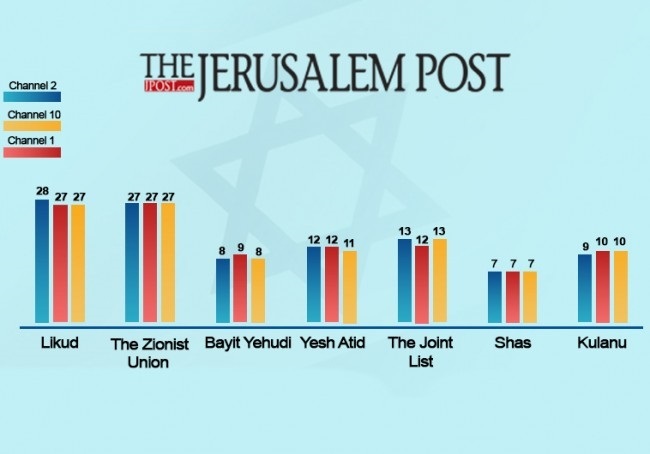 Here’s the latest exit poll results, according to stats compiled by The Jerusalem Post. With nearly all the votes counted, Likud appeared to have earned 30 out of parliament's 120 seats, and was in a position to be able to build with relative ease a coalition government with its nationalist, religious and ultra-Orthodox Jewish allies. Since the parties all fall short of the required 61-seat majority in parliament, the country will now head into weeks of negotiations amid efforts to form a coalition. The left wing appeared to have slightly more seats, but would rely heavily on a new Arab List — an alliance of Arab-majority political parties in Israel — that has said it will not sit in a coalition. That gives Netanyahu and his right-wing allies the upper hand. In the last days of campaigning, Netanyahu had fought to shore up his Likud base and lure voters from other right-wing, nationalist parties, promising more building of Jewish settlements and saying the Palestinians would not get their own state if he were re-elected. ZetaTalk Confirmation 3/21/2015: Of course there was fraud. We have stated that Netanyahu ordered the Mossad to arrange for the assassination of Charlie Hebdo in 2014 to punish France for siding with the Palestinians, and an obvious and pointed assassination attempt against Obama was conducted in Israel recently in 2013. Netanyahu was furious and frantic on election day, but then this was replaced by a confident swagger even before the results swung to his favor, even as the exit polls absolutely showed a tie between he and Herzog. What did he know that his desperation was suddenly replaced by arrogance? Netanyahu would not hesitate to fix an election, and he knew that the fix was in. Israel does not have electronic voting, which supported election fraud for Bush and company in 2000 and 2004. As with the Scotland fix in 2014 which the Queen ordered, it was merely a matter of substituting paper ballots. Reduce the pile for another, increase the pile for Netanyahu. How difficult would this be for the Mossad, which is famous for their skill? Those who refused to cooperate could look forward to a painful death or maiming if they refused. Netanyahu rose to power right after the pointed assassination of Yitzhak Rabin in 1995, and in his mind brutality is rewarded. Despite being considered the Holy Land by Jews and Christians and Muslims alike, Israel in the hands of the ultra-right has a dark history. In 1995 Yitzhak Rabin, the Prime Minister and Defense Minister at the time, was openly assassinated by an ultra-right fanatic. 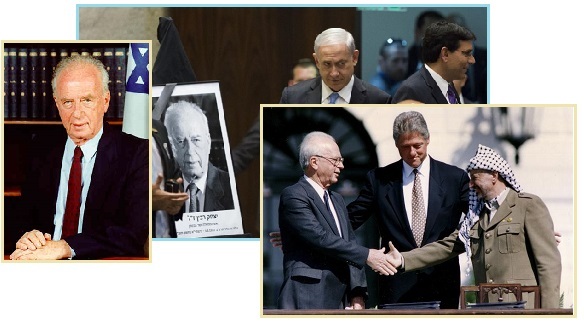 Netanyahu began his rise to power promptly after this, in 1996, becoming Prime Minister. The assassination of Yitzhak Rabin took place on November 4, 1995. The assassination of Israeli Prime Minister and Defense Minister Yitzhak Rabin was the culmination of Israeli right-wing dissent over the Oslo peace process. Rabin, despite his extensive service in the Israeli military, was disparaged personally by right-wing conservatives and Likud leaders who perceived the Oslo peace process as an attempt to forfeit the occupied territories. Netanyahu served as the Israeli ambassador to the United Nations from 1984 to 1988, as a member of the Likud party, and was Prime Minister from June 1996 to July 1999. He moved from the political arena to the private sector after being defeated in the 1999 election for Prime Minister by Ehud Barak. Netanyahu returned to politics in 2002 as Foreign Affairs Minister (2002–2003) and Finance Minister (2003–2005) in Ariel Sharon's governments, but he departed the government over disagreements regarding the Gaza disengagement plan. He retook the Likud leadership in December 2005. Per the Zetas, this is all a sign of the polarization occurring during the Transformation. They predicted that Netanyahu would declare martial law if he saw power slipping through his fingers. Per the Zetas, this has in fact just occurred! ZetaTalk Confirmation 3/21/2015: The question is not if election fraud occurred, but rather what now? We stated that Netanyahu was likely to declare martial law, and this has just occurred. Did the Queen not declare martial law in Scotland when she ordered the election stolen? Did the Bush crowd not declare martial law in 2000 when they manipulated the US election via the Diebold paperless machines? These types of power grabs do not last for long, though they have in the past. 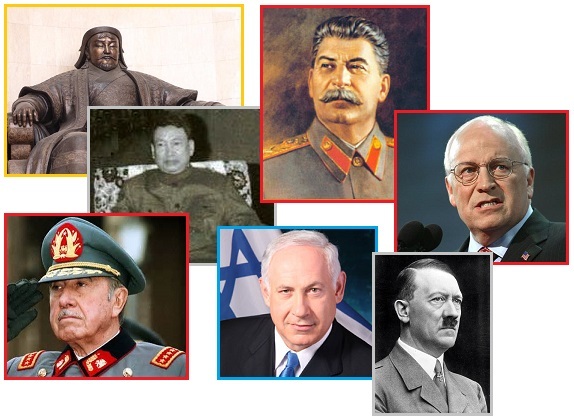 In the past Genghis Khan and Hitler and Stalin and the Khmer Rouge and the Argentina junta (so beloved of Thatcher and Kissinger) and even the Bush era in Iraq had long lives for their campaigns. What has changed is that the elite are rapidly losing their hold on power. They are not only being exposed for what they are by the Council of Worlds, they have been set upon each other as rats in a cage they cannot escape. The media is the holdout, but the banks already want to allow the announcement, moving to the next phase which is to deny that the passage will be as traumatic as ZetaTalk claims. What will Netanyahu’s victory provide him after the announcement? Combined with increased Earth changes, the common man and the leaders they support will see the larger danger, and ignore Netanyahu’s fear mongering. Increasingly, leadership will need to be earned, to the astonishment and horror of brutes like Netanyahu. In 2002, before Nibiru arrived in the inner solar system, the Zetas predicted that NASA et al would blame the Sun for many of the Earth changes caused by Nibiru, aka Planet X.
ZetaTalk Prediction 6/1/2002: Solar Flares, an extended or anomalous solar cycle, has been planned for decades to be used as a distraction and excuse during this time. Solar flares are not anything man on the face of earth can recognize, thus can be made up freely as disinfo. Trust NASA, as they have the Hubble and probes and satellites, and will tell you what has occurred. Of course, they lie. What does all this mean? It means that any reason for the current weather, satellite failure, magnetic diffusion, or heating core along with volcanic and quake increases, are to be blamed on the Sun. Yet another ZetaTalk prediction has just been proven right, again. On March 15 NASA and NOAA and Spaceweather.com were all predicting nothing stronger than a G1 geomagnetic storm (on a scale of G1 to G5) as a result of moderate CME’s on the surface of the Sun. 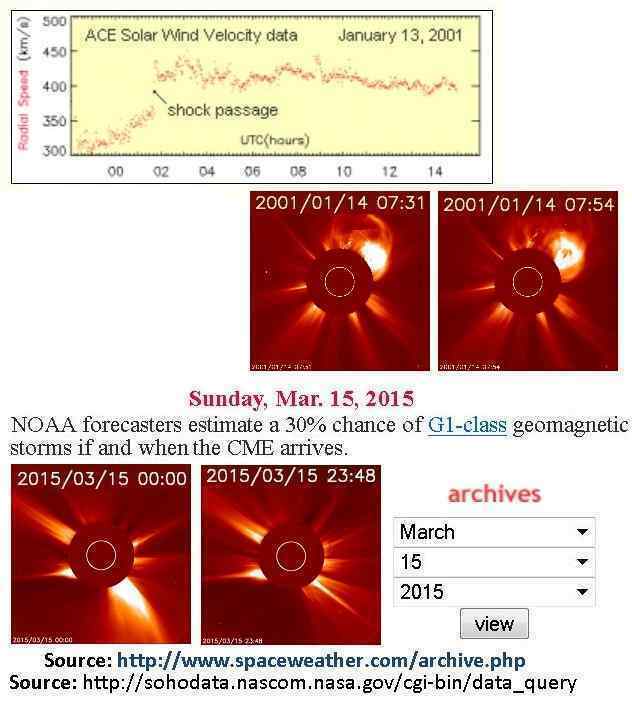 One can compare the CME to another in 2001, which is larger than the CME on March 15. This too only resulted in a G1. A solar filament erupted near the Sun's northwest limb on Sunday, sending this dazzling coronal mass ejection (CME) into space at 744 km/s. The bulk of the CME was clearly directed away from Earth; forecasters do not anticipate substantial geomagnetic disturbances as a result of the explosion. 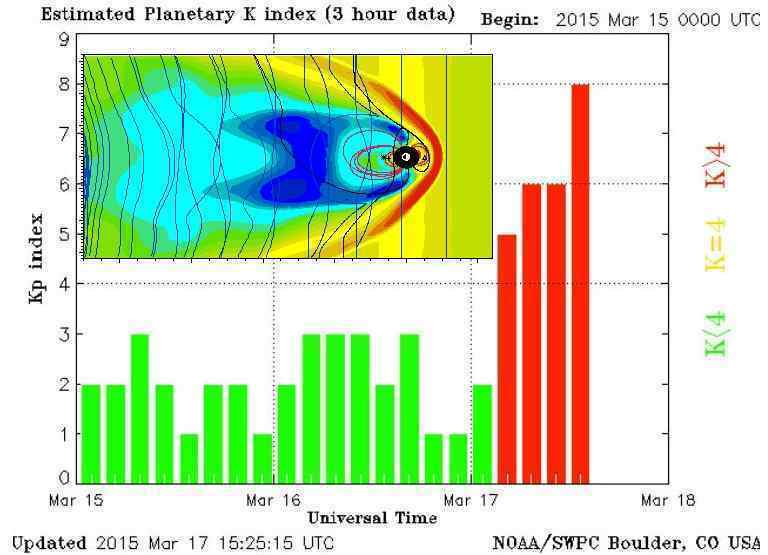 A weak interplanetary shock wave hit Earth's magnetosphere Saturday morning at ~0130 UT. Although conditions at the time were favorable for aurora --namely, the interplanetary magnetic field near Earth was pointing south-- geomagnetic activity remained low. The disturbance was the leading edge of a full-halo coronal mass ejection that billowed away from the Sun on January 10th. The X-flare of March 11th might not be done affecting our planet. According to computer models, a CME propelled into space by the explosion will sideswipe Earth's magnetic field on Sunday, March 15th. NOAA forecasters estimate a 30% chance of G1-class geomagnetic storms if and when the CME arrives. March 15th began with a bang. Between 00:45 UT and 02:00 UT, a magnetic filament erupted in concert with a slow C9-class solar flare from sunspot AR2297. But on March 17, when vast auroras were seen in the Northern Hemisphere, the story was suddenly different. It was caused by a G4 from the CME on the Sun! The truth was that this blast came from Planet X and its charged tail. The evening of 17 March, the inhabitants of Moscow, St. Petersburg, Vologda, Perm and many other cities in central and north-west Russia witnessed the Arctic (North) lights. Scientists have explained to journalists happened a strong magnetic storm. A rare G4, "severe" geomagnetic storm, is underway. The geomagnetic storm is the result of a pair of coronal mass ejections, or CMEs, that left the Sun on March 15 and are now interacting with Earth's atmosphere and geomagnetic field. Dramatic BATSRUS rendering of Earth's magnetosphere almost entirely subsumed by the larger magnetic field of Planet X during a prolonged severe compression earlier today. ZetaTalk Comment 3/21/2015: The CME on March 15, 2015 was not expected, at the time, to result in anything more than a G1 magnetic disruption. In fact, it was given only a 30% chance of reaching a G1 at the time. Then suddenly, on March 17, 2015, the Sun is responsible for a G4 magnetic disruption! What does this say? It says that NASA is still trying to blame the Sun for the magnetic effects of Planet X, aka Nibiru. It says that NASA was not ready for the sudden electromagnetic assault that the charged tail of Planet X gave to Earth on March 17, 2015. 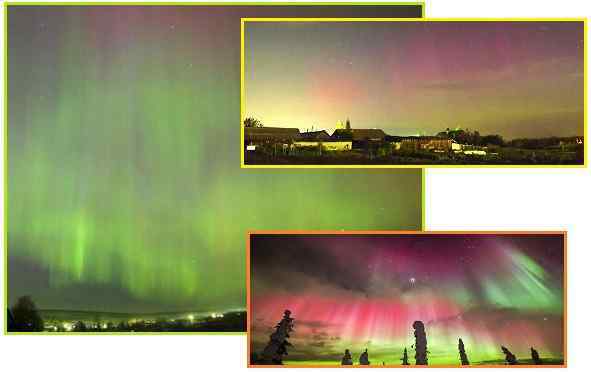 Why do electromagnetic storms affect the Earth’s auroras, which we have described as being the result of a disturbed gravity field of Earth? Like rainbows, auroras are nothing more than light rays bent into a spectrum. Light is highly malleable. When the Earth is under a magnetic assault, it affects the gravity field of Earth which then affects how light is bent toward the Earth at the poles. Lest the readership react with shock at our statement that magnetism affects gravity particle flows, we would point to the child’s exercise to levitate an object above a strong magnetic field. What interferes with the flow of gravity particles, if not the flow of magnetic particles?